A wedding is a time to bring together family and friends in celebration. It may be the first time that many of your guests (including your family and friends) have ever met. Programs are a great way to introduce everyone to your wedding party as well as a convenient rundown of the day or weekend's events. 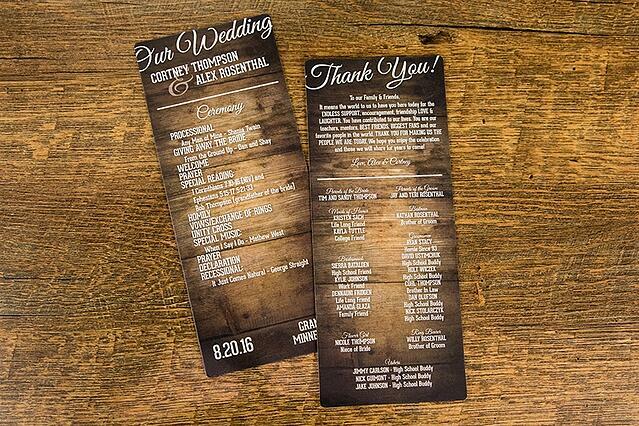 Wedding programs offer many benefits besides relaying information. As Ashley and Ryan shared in their testimonial (found at the link above), many guests also use our durable plastic programs for sun shades and even fans for outdoor events. We love this beautifully simple program that includes a snippet of the ceremony, introductions to the wedding party as well as a thank you note to the guests. 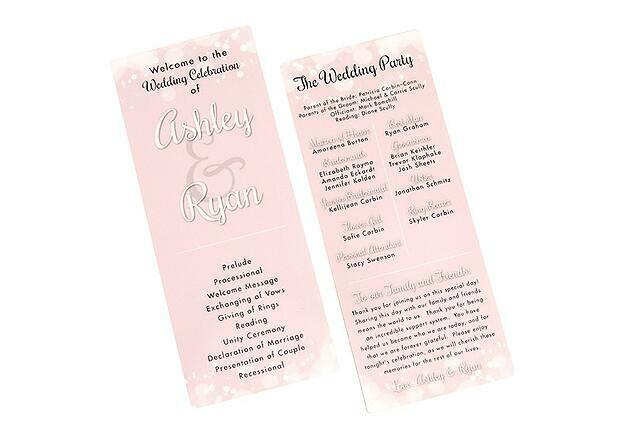 Similar to the pink blush design, this option includes a bit more for the ceremony including readings as well as the wedding songs. 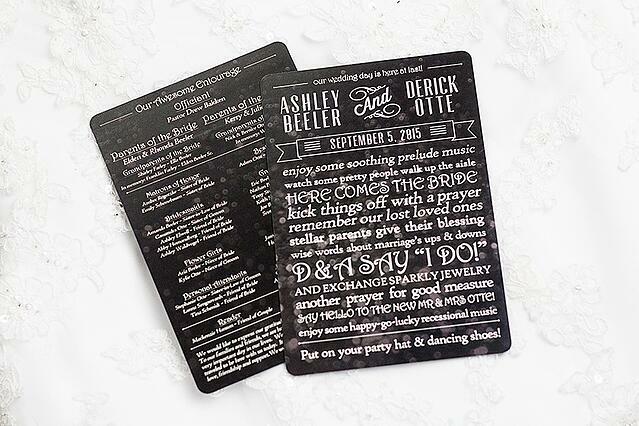 A fun twist on the traditional ceremony outline, this program helps incorporate the feeling for the day. 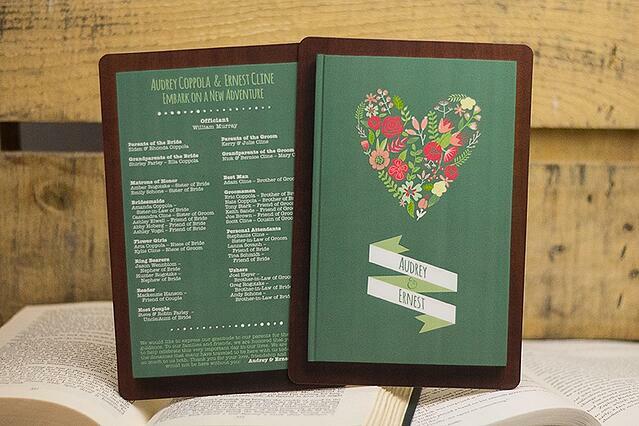 This unique square program incorporates the wedding colors into the design. 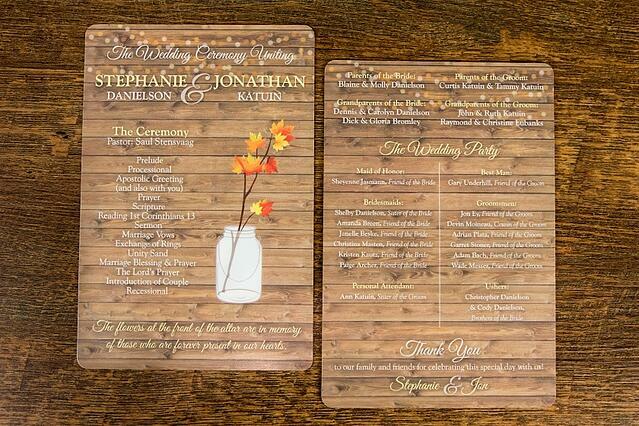 Another way to set the tone is to incorporate different elements of your wedding, like the barnwood, mason jars and fall leaves on this design. 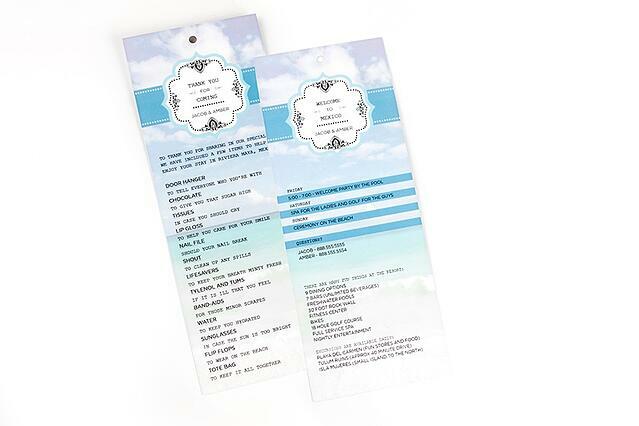 Another type of program lists details for the entire wedding weekend rather than just the day. 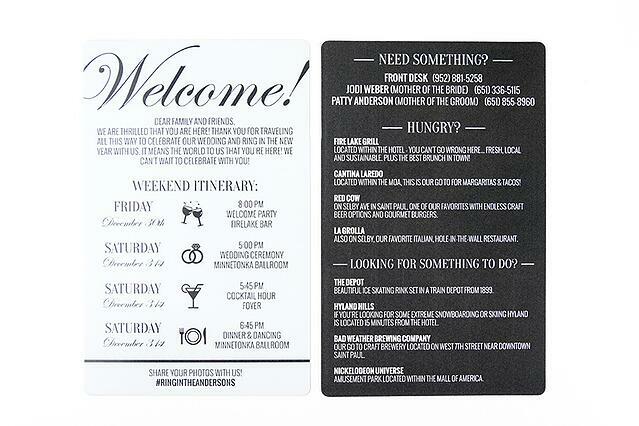 This can be included with your wedding invitations or left in the hotel rooms with welcome bags for your guests. A great way to introduce your family and friends to your spouse-to-be is to include interesting facts about you as a couple. 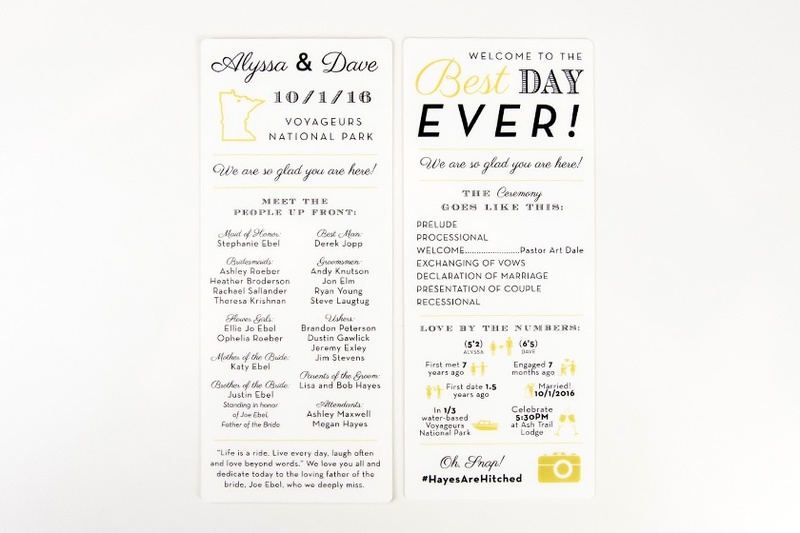 Incorporate your wedding theme through your entire wedding, including your save the date cards, invititations, rsvp cards, programs, thank you notes and more. 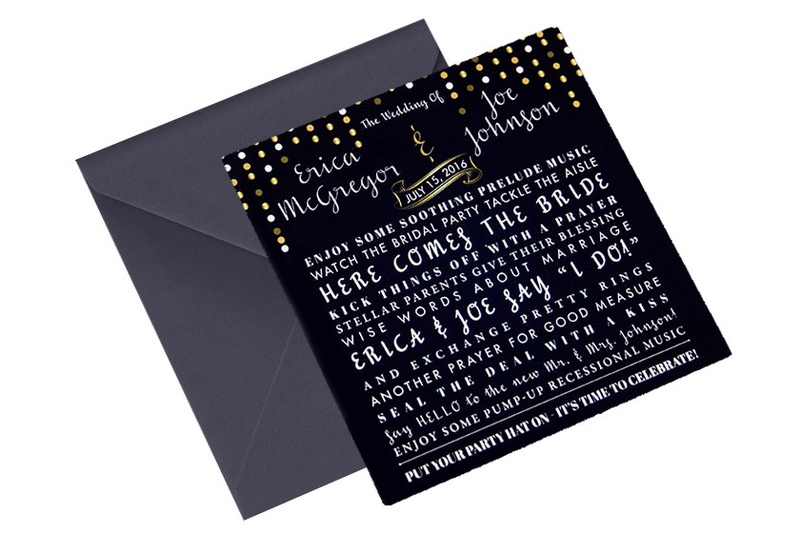 If you have times set up far enough in advance, you can include that information on your wedding invitations for convenience. Incorporate your event details and welcome your guests with a destination wedding welcome bag full of goodies for them to enjoy. For more wedding ideas, check out our Pinterest boards here. 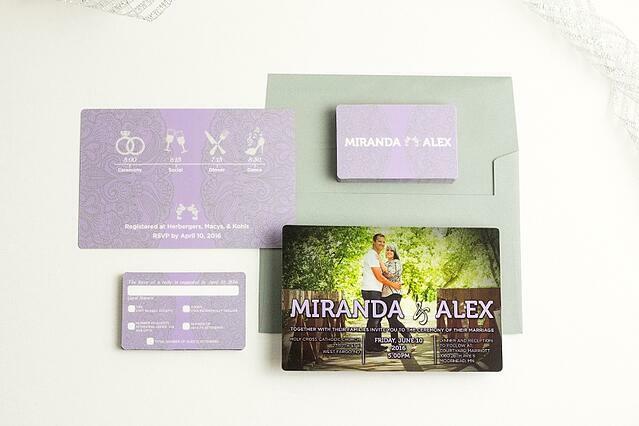 Let one of our dedicated invitation consultants help you put together a one-of-a-kind personalized wedding invitation design. I am the social media and photo addict from Hastings, MN. 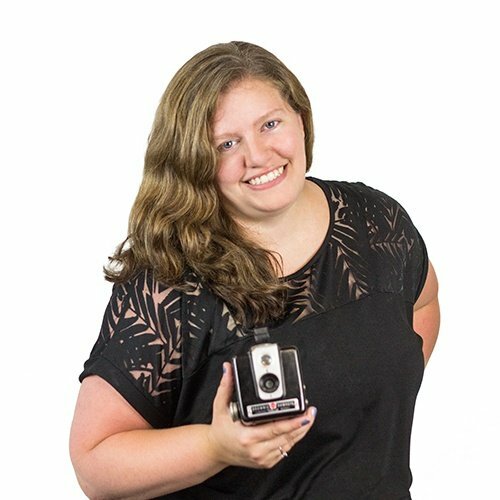 I am the Ambassador of Buzz at Plastic Printers, so my job is basically to talk to you awesome people every day and take pretty photos - it's pretty great! Aside from that, my favorite things are dogs, chocolate and Mumford and Sons.